Ryanair’s Passenger Shakedown | I Write. 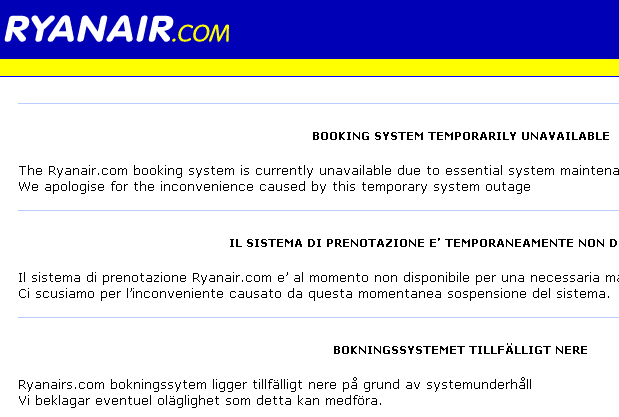 The Ryanair website malfunctioned before my trip to Spain last week and prevented me from checking in online for my flight. The sleazy airline charges a 40 Euro processing fee for those who don’t show a printed boarding pass at check-in, so I thought I would call the airline for assistance with the website. It turns out there is an insulting fee for speaking to Ryanair on the phone, so I rushed off to the Venice Treviso airport expecting the airline to be reasonable about the faulty website. I shouldn’t have to pay to get around their faulty website, right? The response at the Ryanair counter was pay up or step out of line. Not wishing to miss my family vacation, I gritted my teeth and paid the 40 Euro. My family of four boarded with only carry-on luggage, all inspected by the airline employees in Venice–all within acceptable carry-on specs. It all fit just fine in the overheads, since we all knew to travel light on this airline. “That will be 103 Euro,” said a stone faced Ryanair employee. Violence flashed through my mind, but I settled for a verbal expression of my outrage, which was ignored. Having no alternative, I paid the ransom on our baggage rather than abandon it in Spain. When flight attendants began hawking smokeless cigarettes and booze during the flight, it was all I could do not to heckle. ← How Many Have Passed?